Welcome to Copper Ridge Dental online! Dr. R. Erik Cantwell and our dental team are happy to provide dental care for patients of all ages. Our office is very family oriented and has a welcoming atmosphere. We want our patients to have a comfortable experience. Our dentist cares about our patients and wants them to be pleased about the services they receive at our office. We are committed to informing our patients about their treatment options. We educate you so that you can take an active part in your dental care and that of your family. 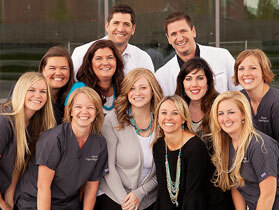 Our dental team works well together, as they have been together for years. They enjoy being together and serving our patients. We can accommodate the needs of Spanish speaking and ASL patients. Our office is up-to-date with the latest in dental techniques and technology. Our office uses all digital X-rays, which use less radiation than traditional X-rays. Dr. R. Erik Cantwell has proudly provides dentistry in West Jordan, Utah, as well as the neighboring areas of South Jordan, Riverton, West Valley City, Taylorsville, Sandy, Herriman, and Draper, Utah. We invite you to contact our dental office today to learn more and to schedule your next visit.